It was found at Jackson Square and returned to me by (redacted) - thank you! Hello! I have recovered your bike! Unfortunately I discovered the Bike Index listing AFTER I purchased the bike but at least we can get it into the owners hands. The crew at Capitol Loans spotted a suspicious person with the bike and helped recover it! I received a phone call at 6:30 from someone saying they were certain my bike is being sold on offerupnow.com. They said they have the same bike, and saw it on offerup at half price, listed under the wrong name. They checked Bike Index, saw my listing, and called. (Some info redacted here) When they showed up... I knew it was mine. I rode it around a bit, flipped it over to check the serial #, and told the seller it is mine. The seller admitted he thought that the bike was stolen. I rode away. An awesome SF police officer had seen my bike on Bike Index, and then spotted it a few days later and recovered it! He called me to let me know, and it really made my day. Then about 30 minutes later, my boyfriend asked me to marry him! So, all in all, a pretty amazing day. ;) The bike is a little beat up but will be rideable again, and even had my favorite bell intact. Thanks so much for creating Bike Index! Bike Index says: a huge congrats to you! Police found it in a homeless camp in poor shape, disassembled with missing pieces. They matched the serial from the Bike Index and brought it straight to me. Now I have a project to work on. A very nice woman ran the serial number on Bike Index and contacted me! Thank You so much, this is my favorite bike and I have it back! You people are awesome! The owner's recovery story is way, way too long to post here, so here's the FB link - however the short version is: spotted for sale on the street, chased all around SF, and then a miracle recovery after that. "I have to give the biggest thanks to Jefferson, Kuy, Chase, Dylan, the SFPD, Bike Index, and the couple who recovered the bike. Ya'll got my back, and I wouldn't have a bike without you." "A third party discovered it and contacted me through the Bike Index. Not all of the bicycle was returned, but I did get the frame, fork, bb, brakes and front hub." - Bike Index notes this bike was recovered without a serial number on file. It was recovered by Dean of StolenBikesNola.org - Got it! Picked it up today. Y'all ROCK!! Another recovery by our friends of the King Co. Sheriff's Office - @kcsobees - "Hey whoever owns this bike contact the BEES we have your bike - the bike was in good condition when we recovered it!" Bike Index: little bit of trivia - have you ever wondered why the KCSO guys call themselves 'bees'? Well, here you go. This bike was spotted but NOT recovered - but I want to share the owner's story here so you are aware of the kind of stunts thieves pull when they sell stolen bikes online: Bike was burgled from a garage, then spotted on Offerup by a Bike Index user. "Owner: we set up a time near us to view the bike ... we contacted the police and they sent someone over to stake it out. They were 10 minutes late, and they had a different bike than what they advertised. When (we) pointed that out (there was a male and a female) the female said, "Oh I know which one that is I think. Let me call the person I think has it." She then stated it went straight to voicemail and that and stated "If I can get ahold of him I'll let you know." And they left. She got a text an hour later that stated the bike was sold and the seller listed it as sold on OfferUp. They also put up the truck they rode in which wasn't registered to the same people ... The police ran the plates. My guess is that they noticed the cop car ... I flagged the seller on OfferUp, but they haven't done anything." 'We are writing from the Community Cycling Center in NE Portland. Your (stolen) bike was donated today. The frame has been damaged and the front wheel is missing.' Bike Index notes: this neat little bike's owner is now in Japan, so a friend here in PDX is going to keep it safe for them. This Asylum Meuse was stolen in Seattle, then spotted for sale on Craigslist by a Bike Index spotter a short while later: "Hey guys, you really helped me and the Seattle police! We did a reverse sting, and we have the bike in perfect condition. The seller is in jail for trafficking stolen property. Thanks again. I'm telling all my friends to register their bikes with you!" The awesome Portland Bike Theft Task force officers took a ride on Portland's notorious Springwater Corridor this weekend and recovered this stolen 2015 PUBLIC bikes R24 in the process. Owner says:"PPB recovered this bike a little more than three months after it was stolen (in a break-in) -- Many thanks to Officer David Sanders!!" 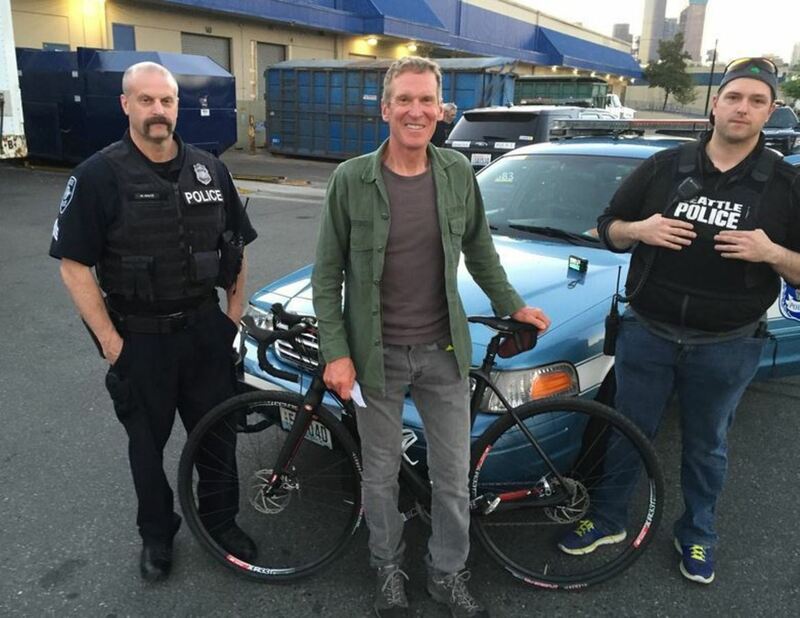 You can see more on @ppbbiketheft, and BikePortland.org also covered this recovery in "Bike Theft Task Force officers host ride-along on the Springwater Corridor" - Thanks @ppbbiketheft! ... and that, friends, is the story of all the bikes we helped recover in July. Stay safe out there!